Basic medical services, surgical procedures, and supplies including antibiotics, syringes and bandages are luxuries for many in most developing nations. Family Care Foundation volunteer medical teams provide free treatment and medicines for thousands of patients each week, and deliver tons of free supplies to hospitals and clinics. We assemble teams of medically trained volunteers for rural medical camps. —Doctors, pediatricians, surgeons, nurses, anesthesiologists, ophthalmologists, optometrists and logistical personnel that provide no-cost surgeries and prescriptions to the needy. 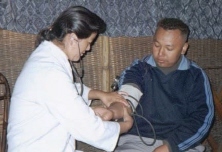 Family Care Foundation also obtains and delivers medical equipment and supplies to hospitals and clinics, builds rural health posts, and provides mobile medical teams. For more on the subject, see Family Care Foundation website.